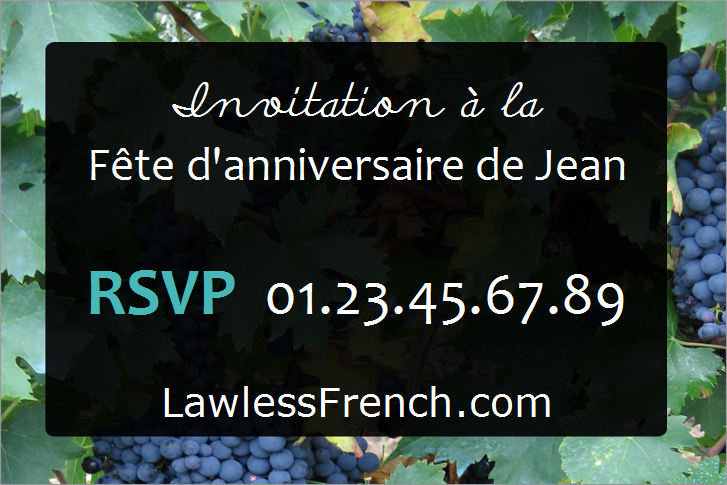 Usage notes: RSVP is short for répondez s’il vous plaît, but this acronym has passed out of favor in France, where it’s considered too formal and old-fashioned. Instead, the French say réponse souhaitée and then their preferred date and/or method of response. Réponse souhaitée avant le 15 août. Please respond by 15 August. Réponse souhaitée à 01.23.45.67.89. Please respond by calling 01.23.45.67.89. Réponse souhaitée par mail. Please respond by email. 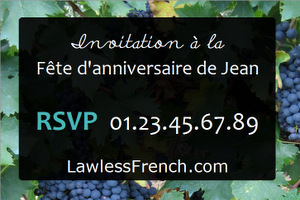 It may be on its last legs in France, but RSVP is alive and well on English-language invitations. Unfortunately, most English speakers seem to think it’s just a fancy synonym for "respond" and therefore say "please RSVP," which makes it redundant (or pleading): "please please respond." I’m going to RSVP tomorrow. Everyone prefers RSVPing by email. Only 10 people have RSVPed so far. RSVP regrets only – Only respond if you will not attend; not responding is taken as a yes.